Innovation is regarded one of the hospital’s core values. Our original and innovative heart operation has brought fame to Rajavithi Hospital and resulted in the Cardiovascular Institute. 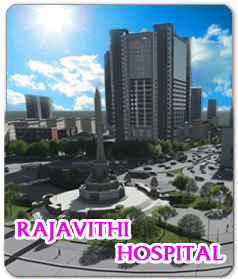 Our medical personnel have emerged to have created many innovative products and a medical innovation center was established at Rajavithi Hospital in 2009 to stimulate and support innovative works. Endowater Irrigating Device : used in combined medical diagnosis and treatment, it activates a water spray of stained blood and excrement examine its course. Ring External Fixation : is a ring shaped bone fixer made of lightweight aluminium. Intra-arterial Line Protector : a device to protect pressure on red vessels tube on the wrist while heart surgery. Medication Error Program for Reporting/Analysis Microsoft Access : reporting a medicinal error of the hospital for finding causes and its solution. Software for Drug Distribution System and Scanner : a development for computerized pharmaceutical distribution of in-patients. SCG Paper Sprint : a corrugated sprint, lightweight and reasonably priced, reducing infections. Non-reusable, Xray compatible and adjustable to the physiology of wounds. Also, it has received a social honorable mention of national innovation for the year 2007 by the National Innovation Agency. Praphawal’s Clamps Non-bypass technique : Sandwich Operation) for heart operation to close leakage from the upper part of heart without using a lung and artificial heart devices. Dust trap system is used for a cleaning process of bed sheets and clothes of patients.